The Stanford Liver Clinic provides comprehensive care for all acute and chronic liver diseases, including hepatitis, fatty liver, cirrhosis, and cancer. Our clinic’s experts in hepatology, radiology, pathology, liver surgery, and other specialties collaborate closely to tailor a care plan to your specific needs. Our doctors provide expert care for all types of liver disease, including fatty liver disease and hepatitis. We offer in-depth experience diagnosing and treating all stages of liver disease, from inflammation and fibrosis to cirrhosis. Our team specializes in delivering compassionate, effective care, even for conditions once thought to be untreatable. For complex cases, our team of hepatologists, surgeons, and other digestive health specialists meets weekly to pool their expertise and discuss the best approach to your treatment. Should you require more advanced treatment, we partner closely with a number of sub-specialty clinics, including the Stanford Liver Transplant Program and the Stanford Gastrointestinal (GI) Cancer Program, to deliver the care you need. New medical advances now allow us to reduce and even reverse cirrhosis. Our team has extensive experience diagnosing, treating, and monitoring all conditions, from routine to extremely challenging. Cirrhosis is the final stage in Chronic Liver Disease where scar tissue slowly replaces normal functioning liver tissue. As tissue is lost, the liver can no longer effectively process nutrients, hormones, drugs, and poisons, nor can it efficiently produce proteins and other substances needed by the body. It used to be thought that damage caused by cirrhosis was permanent. Our doctors now have the ability to slow and even reverse liver cirrhosis in almost all cases. All of our Hepatologists are members of the Stanford Liver Transplant Program and if your cirrhosis is determined to be advanced, your Hepatologist will ensure you are evaluated to determine if liver transplantation is an appropriate treatment option. Our doctors are leading academic researchers who apply the same innovative drive to the delivery of your care. Working closely with colleagues and researchers across Stanford University, they help define the national standards of care for liver disease through ongoing research and participation in the Hepatitis B Research Network, the TRIO Network for Hepatitis B, and other leading medical associations. Hepatitis C, the most common blood borne infection in the U.S., is now curable in almost all cases. Our doctors helped develop new therapies for hepatitis C that can suppress a patient’s viral load to undetectable levels in just 8-12 weeks of treatment. Stanford researchers were instrumental in developing the Model for End-Stage Liver Disease (MELD), an internationally adopted scoring system for assessing the severity of chronic liver disease. This system is used to prioritize the allocation of organs for transplant. When too much fat accumulates in the liver, the health complications can be serious. In this video, Stanford hepatologist Aijaz Ahmed, MD, explains how early diagnosis and treatment by experts helps patients avoid the consequences of fatty liver disease. Understanding your stage of liver disease is crucial to developing the best plan to treat, and in some cases, reverse liver damage. We combine leading expertise with advanced tools to pinpoint the root cause of your symptoms. For example, using a state-of-the-art imaging system, known as elastography, we can analyze certain forms of liver damage, without performing a biopsy or surgery. We are one of the few centers in the country providing comprehensive nutrition care to patients with liver disease through our GI Nutrition Services. We partner closely with the Gastrointestinal (GI) Pain Clinic to provide relief for liver disease. Our Endoscopy Suite allows us to perform many minimally invasive treatments, avoiding the need for surgery. Minimally invasive procedures are performed in partnership with Interventinoal Radiology. Surgery is performed in partnership with our Liver Transplant Program and Bariatric Surgery Clinic. We offer multiple clinical trials for patients with a variety of chronic liver diseases including hepatitis B, hepatitis C, non-alcoholic fatty liver disease, alcoholic liver disease, hemochromatosis, primary biliary cholangitis, and primary sclerosing cholangitis. As a Stanford Health Care patient, you have access to these exciting new approaches. Every day, our doctors collaborate with nurses, registered dietitians, and other health care professionals to develop and implement the most effective care plan for you. Our hepatologists diagnose and treat conditions affecting the liver. Our hepatologists have extensive training and experience in treating all stages of liver disease. Our hepatobiliary surgeons treat benign and malignant diseases of the liver, pancreas, bile duct, and gallbladder. Liver radiologists obtain images of the liver using x-rays, magnetic resonance imaging (MRI), CT scans, ultrasounds, and other technology. Pathologists examine tissue samples taken through an endoscopy or a biopsy to determine the presence of a wide variety of diseases. A highly trained pathologist on our team views samples of liver tissue under a microscope to look for liver disease or monitor its stages. 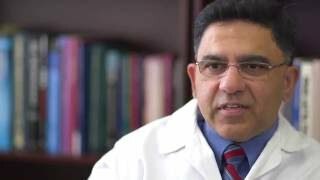 Oncologists focus on the diagnosis and treatment of tumors and cancer. Our doctors work closely with the oncologists at the Stanford Gastrointestinal (GI) Cancer Program. When a liver transplant is needed, we work closely with the transplant surgeons at the Stanford Liver Transplant Program. In cases of fatty liver disease, we work in partnership with bariatric surgeons at the Bariatric Surgery & Medical Weight Loss Clinic. Working with our Liver specialists, our extended care team includes nurse practitioners. They use their advanced skills in digestive health to assist with diagnosis, treatment, and follow-up care. The diet and nutrition experts working with the Liver Clinic have extensive training in the relationship between food choices and liver health. Pharmacists working with our clinic are experienced experts in preparing and dispensing medications specifically for liver conditions. Care coordinators provide you with information and assistance prior to and during your appointments. They help you navigate from your first contact with us to follow-up care, assessing your needs, answering your questions, making referrals, coordinating appointments, and providing education. Medical Assistant–Medical assistants bring you to your exam room after you check in for appointments and take your vital signs before your doctor sees you. New Patient Coordinator–Our coordinators contact you before your first appointment and help you prepare by providing the information you need to know and bring with you. Patient Access Representative–Our patient access representatives greet you at the front desk and register you for your appointments. The Digestive Health Center provides seamless access to all of Stanford's digestive health services — from diagnostic evaluation to treatment and follow-up. We make every effort to coordinate your appointments, so that you can see multiple providers, as needed, during a single trip to our Redwood City location. Parking and directions: Use the map to get our address, directions, and parking information. Insurance and billing: Seeing doctors at the Liver Clinic is easy. We accept self-referrals and most insurance plans. Coordinated care: The Liver Clinic provides access to care from multiple specialties in one convenient location. Do I need a doctor referral to be seen at the Liver Clinic? You can call the Liver Clinic directly to schedule an appointment with one of our doctors. Call 650-498-7999 to make an appointment. The Liver Clinic is located at the following address. Valet and self-parking options are available for a fee. Please plan to arrive 20-30 minutes prior to your appointment time due to construction near the Redwood City campus. This will allow you plenty of time to park, locate your clinic and complete any additional paperwork. Please call our clinic receptionists at 650-736-5555. They are available Monday through Friday, 8:30 a.m. to 5:00 p.m. to help you reschedule or cancel your appointment. To request an appointment with a hepatologist, call 650-498-7999.